Motto in English: "Voice Truth Life" – Speak the truth as a way of life. California State University, Los Angeles (Cal State LA or CSULA) is a public comprehensive university, part of the 23 campus California State University (CSU) system. The campus is located in the eastern region of Los Angeles, California, United States, in the University Hills district, facing the San Gabriel Mountains, at the center of Los Angeles metropolitan area just five miles (8 km) east of Downtown Los Angeles. CSULA offers 129 types of Bachelor's degrees, 112 different Master's degrees, 3 Doctoral degrees including a Ph.D. in special education, Doctor of Education (Ed.D), Doctor of Nursing Practice (DNP) and 22 teaching credentials. CSULA has a student body over 23,000 students primarily from the greater Los Angeles area, as well as more than 215,000 alumni. CSULA operates year round on the quarter system - four quarters, each 11 weeks in duration. CSULA is organized into eight colleges which house a total of four schools and approximately 50 academic departments, divisions and interdisciplinary programs offering a variety of majors. CSULA is home to the critically acclaimed Luckman Jazz-Orchestra and to a unique university center for gifted students as young as 11. The 175-acre (71 ha) hilltop campus core is home to the nation's first Charter College of Education, a NASA-funded SPACE program, Rockefeller-supported humanities center, a National Science Foundation funded environmental research center and other award-winning engineering programs. U.S. News has ranked CSULA's undergraduate business program as one of the best in the nation. The School of Nursing is considered to be one of the best in the state of California. The Charter College of Education has awarded more teaching credentials in the state of California than any other public institution, and includes an innovative baccalaureate degree program in Urban Learning designed to train teachers for the specific demands of urban schools. CSULA also has the nation's largest early/pre-teen collegiate program, and one of the few and the longest-operating graduate Criminal Justice and Criminalistics program west of the Mississippi river. The Television, Film, and Media Studies program is one of the foremost film schools in the CSU system, coordinating film and TV production experiences with the neighboring Hollywood film industry. The university awards more bachelor's degrees to Hispanics than any other California college or university. It is also among the highest of any college or university in the United States today. It is also home to two high schools the Marc and Eva Stern Math and Science School and the Los Angeles County High School for the Arts (LACHSA), a prestigious arts high school, notable for being the only arts high school in Los Angeles that allows for students from any district within Los Angeles County to attend. Classrooms are shared with CSULA, however, LACHSA activities tend to be separate from those of CSULA's. Notable LACHSA alumni include singer Josh Groban, actress Jenna Elfman, actor/singer Corbin Bleu, and UCLA Athletics senior executive Ron "Country Club" Kobata. The campus is located on the site of one of California's 36 original adobes, built in 1776 by Franciscan missionaries and destroyed by fire in 1908. These lands once were part of a Spanish land grant known as Rancho Rosa Castilla, given to Juan Batista Batz, a Basque rancher from northern Spain who settled here in the 1850s. The inspiration for the name of the rancho, according to local historians, was the wild roses that once grew near the ranch home. The main drive through the campus is known as Paseo Rancho Castilla, in acknowledgment of the University's historic heritage. CSULA was founded on July 2, 1947 by an act of the California legislature and opened for classes as "The Los Angeles State College" (LASC) on the campus of Los Angeles City College (LACC). In 1949, the Los Angeles State College was reconstituted by the Legislature as "The Los Angeles State College of Applied Arts and Sciences." In 1964, the Board of Trustees of the California State Colleges changed the name of the college to the "California State College at Los Angeles," and in 1968 to "California State College, Los Angeles" (CSCLA), when it became part of the California State College (CSC) system. In 1972, CSCLA was awarded University status and was renamed California State University, Los Angeles (CSULA). In 1952 the state proposed a new satellite campus for CSULA, at the time known as Los Angeles State College, and in July 1958, the campus separated from CSULA and was renamed San Fernando Valley State College (Now known as California State University, Northridge). Since 1954, CSULA has been accredited by the Western Association of Schools and Colleges (WASC). The University's credential programs are approved by the Commission for Teacher Credentialing Committee on Accreditation. In 1968 CSULA established the nation's first Chicano Studies department. In 1993, the CSU Chancellor and Trustees approved development of Cal State L.A.'s Charter College of Education, creating the first such college of higher education in the nation. Sept. 2000 California Governor Gray Davis chooses the Cal State L.A. campus to hold press conference at which he signs the historic bills expanding the Cal Grant program. Quarterly fees have nearly doubled since the 2001–02 academic year. Tuition and fees for in-state is $6,839; and $15,767 for out-of-state (2012–13) with a student:Faculty ratio 23:1. Classes are scheduled Monday through Saturday from 7 a.m. until 10 p.m.
CSU Los Angeles is one of only eight institutions in North and South America selected as a Rockefeller Foundation humanities fellowship residency site. From 1964 to 1972, developer Louis Lesser built six off-campus, 10-story high-rise residential halls to house 3,600 students. 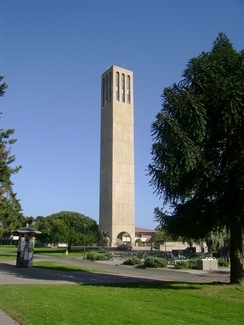 The 175-acre (71 ha) campus lacked space for horizontal expansion, following the California State University expansion plan started in 1959. This doubled the university's housing capacity, making Cal State L.A. the largest in the California State University system. Maxwell Starkman & Associates, AIA, of Beverly Hills, designed the development plan. Unlike other components of the Cal State University system being developed in the 1960s, the residence halls were privately financed by Louis Lesser Enterprises, Inc. The first on-campus housing was opened on June 1984, and three years later, a second residential life complex was opened. CSULA has a student-housing complex where students can rent a house at double occupancy for $655.00 per month (as of November 2009). During 1984 Summer Olympics that took place in Los Angeles CSULA student houses were upgraded and expanded because it housed the athletics of the 1984 Summer Olympics. Lesser also pioneered “underground parking”, with his Cal State L.A. development, at the time considered unusual enough to merit a separate newspaper section header, "Parking Underground", which described a two-level underground parking lot as a "concept" of "subterranean spaces". Cal State L.A.'s parking received press coverage for pioneering the concept of underground parking; to deal with the limitations of ground space for expansion under the initial California State expansion plans of the early 1960s. Developer Louis Lesser developed "underground parking” in his off campus residential housing development for the university in 1964, with only a two level underground parking structure considered so unusual as to merit a separate newspaper section header, "Parking Underground", and calling the parking “subterranean spaces." The school is home to the first commuter train station on a college campus, the CSULA station on Metrolink's San Bernardino Line, which opened in October 1994. The school is also accessible from the California State University, Los Angeles station on the El Monte Busway; both stations are located at the south end of the campus. Metro Local lines 665, 71, and 256, as well as neighborhood shuttles serve the school. In 2013, U.S. News & World Report ranked Cal State LA's nursing graduate program 79th in the nation. Cal State LA is placed 11th (out of 682 U.S. institutions) in the Washington Monthly's 2012 master's universities rankings. In Nov. 2007 the Accreditation Board for Engineering and Technology (ABET), the national accreditation organization for engineering education, bestowed upon Cal State L.A. its President's Award for Diversity, citing the University's decades of success in increasing diversity among engineering students and in the ranks of technology professionals. CSULA's School of Nursing launched the Doctor of Nursing Practice (DNP) on fall 2012. The DNP has been accredited by the Western Association of Schools and Colleges (WASC). The most popular majors at California State University—Los Angeles include: Business, Management, Marketing, and Related Support Services; Health Professions and Related Programs; Social Sciences; Homeland Security, Law Enforcement, Firefighting and Related Protective Services; and Public Administration and Social Service Professions. The average freshman retention rate, an indicator of student satisfaction, is 78.2 percent. The College of Business and Economics offer's 3 different degrees: BS in Business Administration, BS in computer Information System, and a BA in Economics with 17 different options and 6 Minors. Cal State L.A.’s College of Engineering, Computer Science, and Technology is divided into five departments—the Departments of Civil Engineering; Computer Science; Electrical and Computer Engineering; Mechanical Engineering; and Technology. Collectively, these departments offer 12 undergraduate programs, four graduate programs and two teaching credentials. In July 2000 the University's Model United Nations (NMUN) chapter places in the top 30, out of 190 teams in the New York City competition, bringing home its first national conference win since the chapter's inception more than 30 years previous. The CSU Los Angeles student delegation garnered top awards in all categories at the 2009 annual National Model United Nations. In 2010 The student team received both "Outstanding Delegation" and “Outstanding Position Papers”—the highest honors a delegation can receive. Having established the nation's first Chicano Studies Department in 1968, today, CSU Los Angeles is a top source of bachelor's and master's degrees for Hispanic students in California. For two consecutive years, CSU Los Angeles has had the largest group of students from the CSU selected for the 2008–09 Sally Casanova Pre-Doctoral Scholarship. Since 2008, 32 students have been granted $3,000 each to pursue doctoral studies in music, the sciences, language, literature, and education. It includes two Presidential award professors and 12 faculty members honored with CSU Outstanding Professor Awards—more than any other university in the 23-campus system. In Sept. 1996 Chemistry professor Carlos G. Gutiérrez is among the first honorees named by President Bill Clinton to receive the newly established annual Presidential Award for Excellence in Science, Mathematics and Engineering Mentoring, at a White House ceremony. In Dec. 1999 Raymond Landis, Dean of Engineering and Technology, is honored by the White House for Outstanding Student Mentoring. The recognition earns University its second Presidential Award. The Fulbright U.S. Scholar Program recognized seven CSU Los Angeles professors over the past two years, giving them the opportunity to research and teach at universities in Qatar, Hong Kong, Japan, Iceland, Togo, and Cyprus. In 2009, the CSU Los Angeles Fulbright contingent was one of the largest in the country, ranked in the top 10 nationally out of the more than 400 universities in the program. The Desert Studies Center is a field station of the California State University located in Zzyzx, California in the Mojave Desert. The purpose of the Center is to provide opportunities to conduct research, receive instruction and experience the Mojave Desert environment. Is officially operated by the California Desert Studies Consortium, a consortium of 7 CSU campuses: Fullerton, Cal Poly Pomona, Long Beach, San Bernardino, Northridge, Domingues hills and Los Angeles. The college of Engineering, Computer Science, and Technology (ECST) has achieved international recognition with its advanced vehicles. CSULA's Team Solar Eagle has built three cars that competed in solar car races in the United States and Australia, winning a national championship at the American Solar Challenge in 1997. The 1997 champion Solar Eagle III was the first solar and only Hot Wheels (r) reproduction of a student-built vehicle. The Solar Eagle II is on display at the California Science Center in Los Angeles. The College was funded by NASA to advance aerospace technology and space research. Cal State L.A.'s NASA University Research Center is only one of its kind in the state of California. The objective of the program is to design and build a segmented reflector test-bed. On August 2006 Cal State L.A. became the first university west of the Mississippi and second overall to achieve successful flight powered by fuel cells. The unmanned aerial vehicle was developed by a team of mechanical engineering students working in Cal State L.A.'s Multidisciplinary Flight dynamics and Control Laboratory (MFDCLab). In April 2011 Cal State L.A. was chosen to become part of the 3-year AVTC EcoCAR2: Plugging into the Future competition managed by Argonne National Laboratory and sponsored by the US Department of Energy and General Motors. EcoCAR2 tasks 15 universities to modify a Chevrolet Malibu into a plug-in hybrid while maintaining safety and consumer acceptability. The university has chosen a parallel-through-the-road architecture as part of the competition. The competition is a collaboration between the College of Engineering, Computer Science, and Technology and the College of Business and Economics, with Engineering handling the design and implementation of the vehicle systems and the Business handling budgeting, fundraising and promotion of the program. On May 2013 Cal State L.A.’s EcoCAR 2 team came home 2nd place overall in Year Two of the EcoCAR 2: Plugging In to the Future collegiate engineering competition. The Early Entrance Program (EEP) is an early college entrance program for gifted individuals of middle school and high school ages a unique educational program that is specifically designed to permit young, highly gifted students to enroll in college as full-time students. 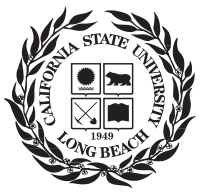 The Early Entrance Program was established at California State University, Los Angeles in 1982. The Program allows qualified students as young as 11 years of age, the opportunity to excel at the university level. The program maintains a population of approximately 150 full-time highly gifted teen-aged students known as "EEPsters." Every year, approximately 100 academically gifted students from all over the United States apply to EEP, with 25–40 applicants admitted. Students must achieve a combined verbal and mathematics score of 1100 on the Scholastic Aptitude Test, with neither score falling below 550; or at least a 24 in English and a 23 in mathematics on the American College Test. After a preliminary interview with the EEP director, prospective students must also undergo a rigorous assessment period called a Provisional Quarter before final admission. CSULA's growing forensic science program has been a part of the University curriculum since the founding of the school. It is home to one of the few and the longest-operating graduate Criminal Justice and Criminalistics program west of the Mississippi river, located in the new Los Angeles Regional Crime Lab. The new Hertzberg-Davis Forensic Science Center, which was dedicated on May 11, 2007, jointly house the LAPD's Scientific Investigation Division, the L.A. County Sheriff's Department Scientific Services Bureau and CSULA Criminal Justice and Criminalistics programs. CSULA also has a comprehensive seafloor-engineering program. Research is conducted at the Naval Facilities Engineering Service Center in Port Hueneme, California. In 2003, Civil engineering professor Mark Tufenkjian led CSULA to receive over half a million dollars in grant money. The award of $594,253 is the largest grant ever received by CSULA's Department of Civil Engineering. The CSULA Eagle Spring water, sold on campus, is the result of a unique partnership between the University's administration and the College of Business and Economics. Together the two branches of the University worked together to develop a product that would appeal to student body and still be cost affordable. The college has developed "experiential" learning projects, which students participate in during their final years of schooling. The University's water bottle project is one such opportunity, recognizing that there is only so much they can teach students from out of a book. The University Times (UT) is a student-run newspaper. The first student newspaper, at that time called The College Times, was published in June 1948 for the first time. In 1965 The College Times was named the best newspaper by California Intercollegiate Press. On October 2, 1972 The College Times changed its name to University Times, in accordance with the change in university status. In January 2007, The University Times changed its publication schedule from a twice-weekly paper to a weekly paper, publishing on Tuesdays. 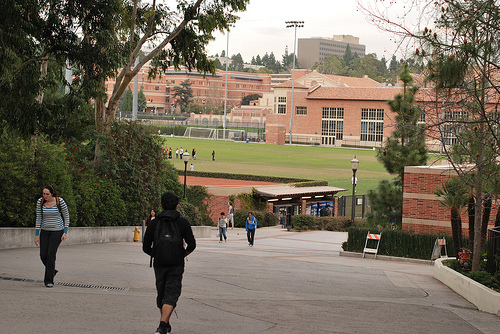 The format change to a style similar to the alternative newspaper, LA Weekly, allowed for a greater number of pages to run and allow more in-depth coverage of news stories relevant to the student body and surrounding community. During the summer of 2007, the University Times underwent a transition period as the paper started a merger process with its new online presence, Cool State. The paper scaled back production to four issues at the end of the summer quarter and began to gear up for a formal re-launching with the start of the Fall Quarter. The paper is currently published once a week on Thursday. On Sunday, June 26, 2011 the UT related website CoolStateLA.com won in the category "Best Student Website," and garnered second place notice for best campus paper and best headlines for a publication with a circulation of less than 5,000 at the Los Angeles Press Club Southern California Journalism Awards. The second place for "Best Headline for Publication Under 5,000 Circulation" was for the UT's take on President James Rosser's dismissal of former provost Desdemona Cardoza. In this category, the University Times was competing against mainstream publications, not just campus papers. Cool State Radio is a student run internet radio station based out of CSULA. Cool State Radio or CSR for short has been broadcasting media since its creation in July 2008. CSR's media can be accessed through CSR's audio page web page at Cool State Radio. Excluding the Greek Council and Order of Omega, as of Winter 2013, the CSULA Campus is home to 19 "social" fraternal organizations, 7 fraternities (2 new colonies), 9 sororities, and 2 co-ed fraternities. Within that population there are 2 IFC fraternities, two NPHC fraternities, one statewide Latino fraternity, one International Latino Fraternity, one Armenian fraternity, two NPC sororities, two NALFO sororities, 2 NPHC Sororities (with a third trying to Charter) 3 local sororities, Alpha Theta Pi, Chi Sigma Phi and Kappa Zeta Phi. There are 3 representative governing bodies of the Greek community at CSULA; Greek Council, Multicultural Greek Council and, National Pan-Hellenic Greek Council. They advise and regulate by the university through the Center for Student Involvement, a division of CSULA's University-Student Union. This division is under the auspices of both the University-Student Union and the Department of Student of Affairs. CSULA's Greek System began with the establishment of the Alpha Theta Pi Sorority on November 15, 1948. It has grown into a vast social network of collegiate men and women composed of chapters that are local, statewide, national, and international. Zeta Beta Tau (ΖΒΤ) and Phi Sigma Kappa (ΦΣK) are internationally recognized social fraternities in the CSULA Greek System, otherwise known as IFC Fraternities, and are members of the North-American Interfraternity Conference. Delta Zeta and Alpha Sigma Tau are the sorority equivalencies of the IFC fraternities, and are NPC Sororities (National Panhellenic Conference), a governing body for 26 women's national and international sororities. CSULA is host to five Latino Greek-lettered organizations: The largest Latino based Fraternity in the nation Sigma Lambda Beta, Lambda Theta Nu, Lambda Theta Alpha and Gamma Zeta Alpha. Each of these organizations are NALFO organizations or those whose parent organizations are members of the National Association of Latino Fraternal Organizations with the exception of Sigma Lambda Beta fraternity, which is a member of the North-American Interfraternity Conference. Additionally, CSULA is also home to Beta Gamma Nu a local fraternity. Recently with the continuing growth of Latino organizations on campus, CSULA has become the home for Delta Sigma Chi a co-ed Latino fraternity. Alpha Phi Alpha and Omega Psi Phi are the Historically Black Greek-letter fraternities on the CSULA campus, also known as NPHC fraternities, and are both city-wide Chapters. Delta Sigma Theta and Zeta Phi Beta are the Black Greek Sororities on CSULA, also known as NPHC sororities. They are trying to start a chapter of Sigma Gamma Rho as well. 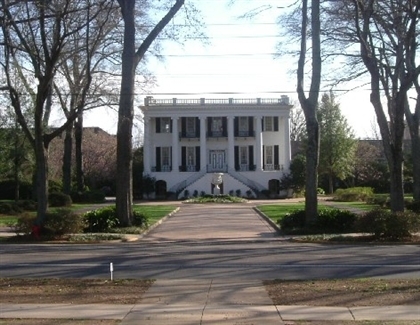 Their parent organizations are members of the National Pan-Hellenic Council. It promotes interaction through forums, meetings and other mediums for the exchange of information and engages in cooperative programming and initiatives through various activities and functions. CSULA is also home to one statewide Asian Greek-letter sorority, Kappa Zeta Phi, and one statewide Armenian Greek-letter fraternity, Alpha Epsilon Omega. The Golden Eagles are member of the California Collegiate Athletic Association (CCAA) and compete on the Division II level of the National Collegiate Athletic Association (NCAA). The university fields eleven intercollegiate teams for men or women in baseball, basketball, cross country, soccer, tennis, volleyball, indoor track, and outdoor track and field. Cal State L.A.'s more than 11 acres (4.5 ha) athletic facility is named the Billie Jean King Sports Complex. The sports complex—designation which was approved by the CSU Board of Trustees Sept. 21—features the Eagles Nest Gymnasium, the University Stadium, Jesse Owens Track and Field, Reeder Field (baseball), the swimming pool, and tennis and basketball courts. 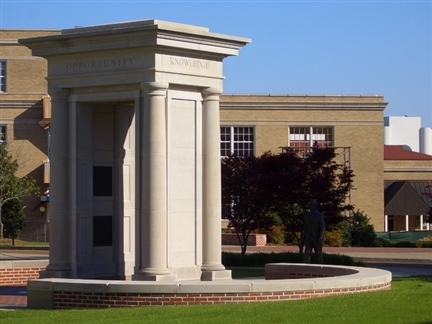 Since 1982, a wooden A-frame sculpture in title "Time Line for Forgotten Ancestors" has been displayed on the lawn west of the John F. Kennedy Memorial Library's Palmer Wing, across from the bookstore. It was donated to the CSULA Art Department by artist Michael Davis. The university has begun the planning phase of a four-story faculty/staff housing project that will consist of 18 three or two bedroom units on the west side of Paseo Rancho Castilla across from the Welcome Center. Construction is nearing completion on a Hydrogen Fueling Station on campus. The station will operate as a teaching resource for classes on alternative energy and fuel systems, as well as a public accommodation selling and dispensing hydrogen to those driving fuel cell vehicles. CSULA is one of only three organizations in the state to be awarded CARB funding for such a facility. Description above from the Wikipedia article California State University-Los Angeles licensed under CC-BY-SA, full list of contributors here Community Pages are not affiliated with, or endorsed by, anyone associated with the topic. Are you a current student? Weigh in! Click here to find out your odds of getting in. We’ll create your personal admissions roadmap. Interactive lessons from top admissions experts. Learn how to improve your entire application. 1-on-1 help getting in to your top choice schools. Make the best decisions about your higher education. Find free money for college and search scholarships from over 10,000 financial aid programs. Know before you owe! Nerd Wallet’s Student Loan Calculator helps you make the most informed decisions about financing your higher education. Copyright © 2012 Unigo LLC. All rights reserved.